Veal is meat from calves, usually male calves of dairy cattle. It is usually lighter in color, tender in texture, and with a more delicate taste than beef. Veal is eaten in many countries, but is particularly important in French cuisine and Italian cuisine, and also the usual meat for Austrian cuisine's Wiener schnitzel. Over the last few years, there has been some controversy associated with veal, because of animal welfare issues relating to how the calves are farmed. Use Pork and Veal Magic to give great flavor to roasted, broiled, grilled, bronzed or blackened pork, veal and lamb. All natural, contains no MSG or preservatives and is Kosher approved. Chef Paul Prudhommes Magic Seasoning Blends has been in business since 1982 when customers from Chef Pauls New Orleans-based K-Pauls Louisiana Kitchen restaurant began asking to take home the chefs unique seasonings. What was once a garage-housed operation has grown to a 50,000 square-foot plant. Currently, Magic Seasoning Blends offers all-natural, MSG free products in sixteen different blends; Magic Pepper Sauce; seven ground, dried Magic Chiles; four Magic Sauce & Marinades; and several cookbook gift-packs. To use Magic Seasoning Blends in Chef Pauls recipes simply add up the amount of dry herbs and spices called for in the recipes "Seasoning Mix". 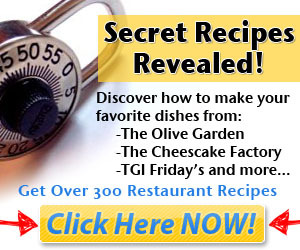 Substitute the appropriate blend (for example, if you were doing a chicken dish, youd substitute Poultry Magic) in the proportioned amounts for each cookbook listed below: Substitute approximately ¾ the amount for Chef Paul Prudhommes "Seasoned America" Cookbook Substitute approximately ½ the amount for Chef Paul Prudhommes "Fork In The Road" Cookbook Substitute approximately the same amount for Chef Paul Prudhommes "Fiery Foods That I Love", "Louisiana Kitchen", "Kitchen Expedition", and "Louisiana Tastes" cookbooks If a recipe calls for a sweet spice or an unusual ingredient subtract the amount of sweet or unusual spice prior to adding up the dry herb seasoning mix, then add back the subtracted ingredient(s) to the Magic Seasoning Blends amount required for the conversion. USDA Prime Veal Osso Buso may be prepared using your favorate recipe. Veal is considered a lighter tasting beef and is lean in texture. Calves are started on milk formula and switched to a quality grain diet once weaned. The farm adheres strictly to never using growth promoting hormones or steroids. Braising vegetables, white wine and broth is a preferred cooking technique although also great in a slow cooker or stewed in tomato sauce. Product of Canada. 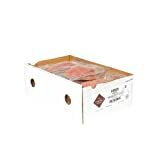 Advance Food Vincello Hand Selected Veal Cutlet, 2 Ounce -- 80 per case. Advance Food Vincello Hand Selected Veal Cutlet, 2 Ounce -- 80 per case. Hand selected, sliced and trimmed exclusively from the best leg muscles. Pre-pounded for increased tenderness. Vacuum-sealed and frozen to ensure freshness. Ideal for saute applications. 2 cutlets per pouch. USDA Prime All Natural Milk fed veal cutlets from the leg,sliced thin Italian style all ways fresh never frozen. You're halfway to a terrific Veal Parmesan! 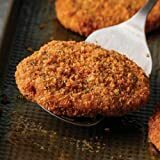 Delicious ground veal in the seasonings of Old Italy coated with bread crumbs, Romano cheese, garlic and cornmeal ready to saute and serve. INGREDIENTS: Veal, Mustard, Batter: Batter Mix: (Yellow Corn Flour, Enriched Flour (Bleached Wheat Flour, Malted Barley Flour, Niacin, Reduced Iron, Thiamine Mononitrate, Riboflavin, Folic Acid), Yellow Corn Meal, Salt, Leavening (Sodium Acid Pyrophosphate, Sodium Bicarbonate), Dextrose, Carboxymethyl Cellulose Gum, Soy Flour), Water. Breading: (Bread Crumbs (Bleached Wheat Flour, Sugar, Yeast, Salt), Salt, Romano Cheese (Pasteurized Part-Skim Milk from Cows, Cheese Culture, Salt, Enzymes), Spices, Garlic Powder, Onion Powder, Natural Flavor). Contains: Wheat, Soy and Milk.